President Donald Trump Thursday offered his first budget, calling for big increases on military spending and large cuts in foreign aid and other domestic programs. In his budget message, Trump said the spending proposal carries out his campaign promise to protect the American people. “A budget that puts America first must make the safety of our people its number one priority -- because without safety, there can be no prosperity,” Trump said. But the president needs congressional approval to make the major spending changes he is proposing. And Congress is certain to make changes. “It is clear that this budget proposed today cannot pass the Senate,” said Senator John McCain, a Republican from Arizona. A number of leading Republicans, including McCain, came out against big cuts in foreign aid and diplomatic programs -- even before Trump released his spending proposals on Thursday. 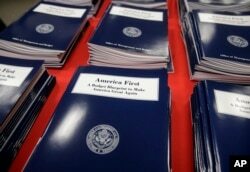 Copies of President Trump's first budget. Many budget proposals by American presidents are declared “dead on arrival.” Norman Ornstein, congressional expert for the American Enterprise Institute, said that will be the case with Trump’s budget proposal -- even with Republican majorities in both houses of Congress. But Jennifer Nicoll Victor, a political scientist at George Mason University in Virginia, expects Trump to get a good part of his spending proposals approved. “The likely prospect of some obstruction in the Senate especially will probably force some compromises, but I would expect them to be on the small side,” Victor said. Trump is proposing big changes in America’s government. The president wants to add $54 billion in defense spending, a 10 percent increase, and another $2.8 billion to the Department of Homeland Security. The Homeland Security increases will go largely to add more border patrol agents and to build a wall along the U.S. southern border with Mexico. Those spending increases are offset by cuts of $11 billion from the State Department, $15 billion from Health and Human Services, and $2.5 billion from the Environmental Protection Agency. The proposed budget cuts affect aid to foreign countries, funding for the United Nations and World Bank, medical research, housing for the poor and money to the arts. Federal employee unions warned the budget would force the firing of many federal workers. Some said it would be the largest cut in the American federal workforce since World War II. Trump would end federal funding for 62 agencies and programs, including the Corporation for Public Broadcasting and AmeriCorps. The Corporation for Public Broadcasting helps fund programs such as the popular children’s show, “Sesame Street.” AmeriCorps sends volunteers to work on programs that help low-income Americans. Trump’s budget director Mick Mulvaney said the president is putting his campaign proposals into budget numbers. By strong power, Mulvaney meant mostly military and law enforcement. By soft power, he meant programs such as diplomacy and foreign aid. Mulvaney said the administration is willing to work with Congress on changes to the president’s budget. But he said the budget provides enough funding for agencies such as the State Department and Environmental Protection Agency (EPA) to carry out its most important responsibilities. 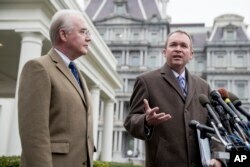 Budget Director Mick Mulvaney, right, joined by Health and Human Services Secretary Tom Price, outside the White House Monday. But critics said the cuts go too far. Environmental groups said that the cuts to the EPA mean the agency will not have enough employees to protect Americans from air and water pollution, or carry out the 2016 Paris Climate Change agreement. “Money talks, and Trump’s budget proposal screams that the only thing that matters in his America is corporate polluters’ profits and Wall Street billionaires,” said Michael Brune, executive director of the Sierra Club, an environmental group. House Speaker Paul Ryan of Wisconsin, a Republican, said he welcomes Trump’s proposals “to turn the page from the last eight years” of the Obama administration. I'm Bruce Alpert. And I'm Jill Robbins.